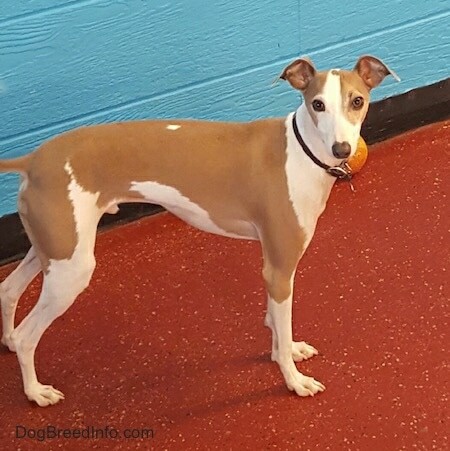 Grover the Italian Greyhound at 4 years old at doggie day care. The Italian Greyhound is a slender, fine-boned little dog. The head is long and narrow, almost flat on the top with a muzzle that tapers to a point. It has a slight stop. The nose is black or brown, depending on the color of the dog's coat. The teeth meet in a scissors bite. The medium-sized eyes are dark. The small ears fold back along the head, and when the dog is alert they angle to the right. The long neck is arched. The chest is deep and narrow. The front legs are straight. Dewclaws may be removed. The long, low-set tail is thin, tapering to a point. The short, glossy coat comes in all colors, including gray, slate gray, red, fawn, blue, black, white or cream. The dogs can be white with color markings or color with white markings on the chest and feet. A flecked version also exists but is not accepted in all countries. Brindle and black and tan are not accepted into the AKC show ring. 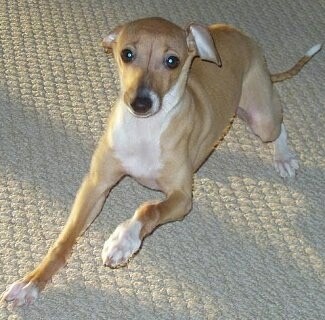 The Italian Greyhound is playful, keen, affectionate, intelligent and kind-mannered. It is generally submissive and wants nothing more than to please its owner. 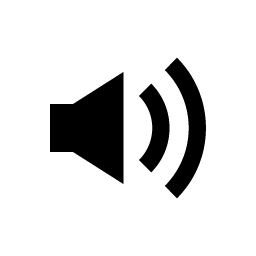 It is sensitive to the tone of one's voice and will not listen if it senses that it is stronger minded than its owner, however it will also not respond well to harsh discipline. Owners need to be calm, yet possess an air of natural authority. Can be reserved with strangers; socialize well. Adult dogs are not as fragile as they may appear. Generally they are not difficult to train provided their handler is consistent with them. This dog can be high-strung and timid if overprotected, and does not receive enough exercise, including a daily pack walk. It does best in a quiet household, although it does get along well with children and other dogs and cats, so long as the humans around it display leadership. In a stressful situation, do not try to reassure the dog by stroking or cuddling, as this intensifies the stress in the dog. In the dog world, when a dog is in an unstable state, and you try and give him reassurance with affection, the dog sees you as being in a weaker state than his own. This intensifies the instability. You need to give off a stronger, more stable energy the dog can feed from. Italian Greyhounds are very dependent and peaceful. This dog needs you to be his pack leader. Dogs that are babied and overprotected will be snappish if they are frightened. Do not allow your little dog to develop Small Dog Syndrome, where the dog believes it rules the home. This can cause a wide variety of varying degrees of behavior problems. Can be difficult to housebreak. This breed is extremely fast, very active and is able to climb. There are two weight varieties: 8 pounds (4 kg) maximum, and over 8 pounds (4 kg). Italian Greyhounds are prone to epilepsy, slipped stifle, fractures, PRA (Progressive Retinal Atrophy). Dams whelp easily. Adult dogs are fairly hardy, however puppies are more fragile up until they are about eighteen months old, and they can break a leg rather easily. During this time be careful with them, but do not treat them like little babies or you will produce an unstable dog. The Italian Greyhound is good for apartment life. They are fairly active indoors and will do okay without a yard. They are sensitive to cold weather. Owners will often put a shirt on them. Italian Greyhounds are active little dogs who need a good, daily walk. In addition, they love to run free and play. Be sure to make them heel on the lead. Dogs not only have an instinct to migrate daily, but to have a leader leading the way. Humans should enter and exit all door and gateways before the dog. In order for your dog to fully respect your authority you need to be their leader rather than the other way around. The Italian Greyhound is one of the easiest dogs to groom. All that is needed to keep the fine, silky coat gleaming is a rubdown with a piece of toweling or chamois. Only bathe when absolutely necessary. After bathing make sure the dog is thoroughly dry and warm. Trim toenails regularly. This breed sheds little to no hair. The Italian Greyhound is an ancient breed. A 6000-year-old Egyptian tomb shows dogs similar to the Italian Greyhound. They are also depicted on decorative Mediterranean art of 2000 years ago. The dogs became popular with noblemen during the Renaissance. A small Greyhound type dog was found in an ancient lava flow in the city of Pompeii, which is the ruined and partially buried Roman town-city near the modern Naples in the Italian region of Campania. 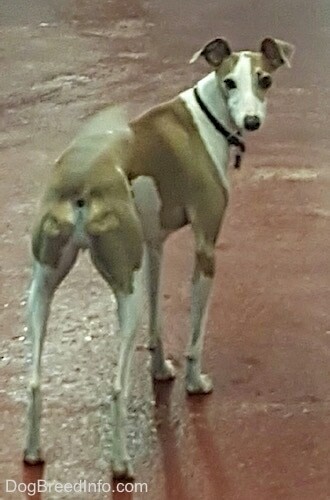 In the sixteenth century, like the Greyhound, this breed was brought to Europe by the Phoenician civilization, and became popular with European nobility. James I of England, Catherine the Great of Russia, Anne of Denmark and Queen Victoria, all owned Italian Greyhounds. During the 1700s Frederick the Great of Prussia took one of these little dogs to war with him, and he buried the dog himself when it died at the Sans Souci Palace. It was Frederick's dying wish that he be buried next to his dog, so on the 205th anniversary of his death, on 17 August 1991, Frederick's family transferred his remains to Sans Souci, and placed them beside his little Italian Greyhound. In the 19th century an African chieftain liked the dogs so much that he offered 200 cattle in exchange for a single Italian Greyhound. 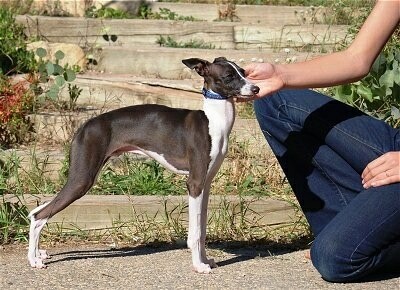 The Italian Greyhound was recognized by the AKC in 1886. A pack of Italian Greyhounds—left to right: Sonny (age 2), Timer (age 10) and Streaky (age 12).